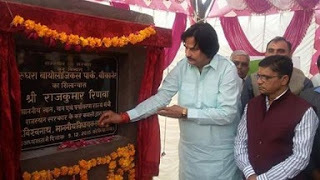 Minister of Forest and Enviorment, Rajkumar Rinwa laid foundation of Marudhara Biological Park in Bichwal region of Bikaner district in December 2015. Biological Park, Bikaner will be spread over 445 Hectare land with budget of Rs. 36 core as Rs. 25 Crore was announced in Rajasthan Budget 2015-16 earlier. It will be constructed as per guidelines of central Zoo Authority of India (CZAI).